Parties at Silver Lining | Silver Lining Cupcake Co.
Have you considered having your next get-together at Silver Lining Cupcake Co.? Silver Lining is the perfect intimate location for birthday parties, bridal or baby showers, book club meetings, and sorority events. We can host parties during business hours, or we can arrange a special private event after hours or on Sundays. 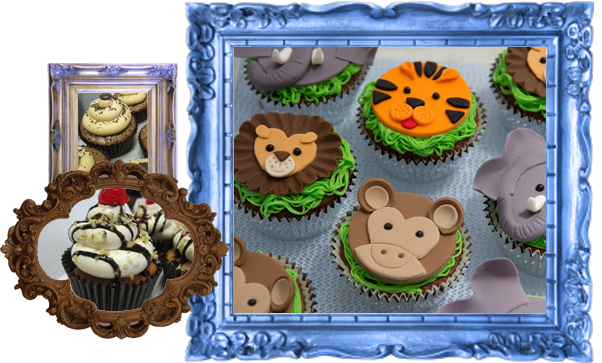 If your child loves cupcakes, then what could be better than a cupcake-themed birthday party? Bring your own games and gifts and we’ll provide the cupcakes and drinks, or consider having a Cupcake Bar party. For a Cupcake Bar party, we provide freshly-baked but unfrosted cupcakes, artfully arranged with an array of frostings and cupcake toppings. After a demonstration, your child and his/her friends get to work creating their own delectable works of art! If you’d like to do something extra-special, we can turn your Cupcake Bar into a Cupcake Sundae Bar, with ice cream to top off the cupcakes! We’re also happy to provide to-go boxes, if you’d like your guests to have an extra cupcake creation to take home. Sidenote: The Cupcake Bar can also be a fun and exciting party for adults, and is great for showers! Silver Lining is a unique place for meetings and study groups. Our free wi-fi means you’ll have an internet connection if computer usage is a must. In addition to cupcakes, we serve a variety of drinks, including Jittery Joe’s coffee, iced coffee, and sweet tea to keep your group caffeinated and alert. So, next time you need a cozy venue for your small gathering or large party, give us a call, and we’ll arrange the perfect thing to make your day special.